From ""Ma Perkins"" and ""One Man's Family"" in the 1930s to ""All My Children"" in the 1980s, the soap opera has capture the imagination of millions of American men and women of all ages. 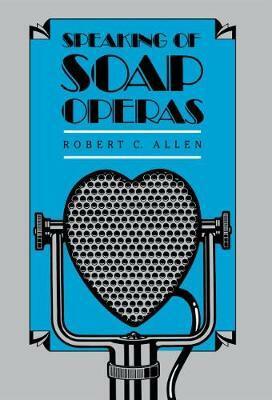 In Speaking of Soap Operas , Robert Allen undertakes a reexamination of the production and consumption of soap operas through the use of a unique investigatory model based on contemporary poetics and reader-response theory. Although a considerable amount of research has been conducted on these programs, Allen argues that soap operas remain a phenomenon about which much is said but little is known. Soap operas are different from most other media programming -- they appear formless, refuse to end, require little work on the part of the viewer, and bear no recognizable marks of authorship. For these and other reasons, soap operas resist explanation from both traditional aesthetic and empiricist social science perspectives. The daytime dramatic serials generate nearly a billion dollars in revenue each year for the three commercial networks. Allen discusses in detail the economic and institutional functions of these programs in addition to the context of their production. He also considers the historical development of the soap opera as advertising vehicle, narrative structure and ""women's fiction."" Speaking of Soap Operas is based on the author's own experiences as a soap opera viewer; extensive interviews with soap opera writers, producers, and actors; and the papers of Irna Phillips, creator of dozens of successful ratio and television soap operas. Drawing also upon trade publications, popular periodicals, and broadcast archives, this work is an important contribution to the field of mass communication. Robert C. Allen is Smith Professor of Radio, Television, and Motion Pictures and associate dean of the College of Arts and Sciences at the University of North Carolina at Chapel Hill. He is author of Speaking of Soap Operas and Horrible Prettines: Burlesque and American Culture and coauthor of Film History: Theory and Practice.